Natan Hadida, retired police officer, born in Tunisia, father of 6, grandfather of 25; he just had complicated brain surgery. Edward Progher, from Moscow, also post-brain surgery. 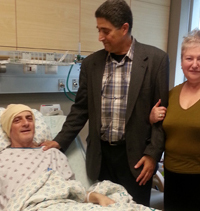 “We came here because we knew nothing in Moscow could compare to Hadassah Hospital,” he said. Adiel Abusneneh, 25, mother of five, from Hebron; her life had been threatened by a tumor in her throat that was cutting off blood to her brain. 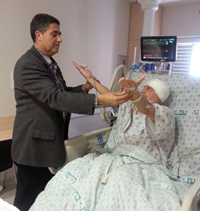 “In Hebron, everyone with a serious problem knows there’s just Hadassah,” Mrs. Abusneneh’s husband noted. Pictured with them is Prof. Yigal Shoshan, head of Neurosurgery. Prof. Shoshan will be the guest speaker at a gala in Southern California at the end of April.